In the 99th post, I set up a contest for some unspecified (but cool) prize, and it’s still unspecified, so let’s hold off for another week, since I think knowing what you’re getting is a pretty darn good motivator. It’s not going to be finished this evening. 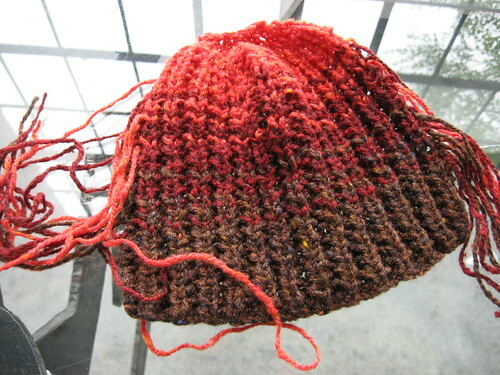 I got all excited last night when I bound off the stitches, even though it looked really funny and narrow and not like it should, but I was still pretty happy, and then I read the pattern and saw that I had only knit half of it. Oh. So that’s why it went so fast. Heh. I’m knitting the rest over the course of the next two weeks. However, I did alter the pattern to include striping and a larger size, so it’s still an accomplishment, albeit a half-finished one. Trust me, though, it will be excellent when it’s done, and the second half is going to be as nice as the first. I should probably learn to read directions, though. This entry was posted in Cool things, knitting and tagged 100th post, knitting, silly me, super secret. Bookmark the permalink.